The year is only two days old and yet two Christian communities’ hopes for a compassionate new year were devastated by hatred during what should be the most peaceful time of the year. 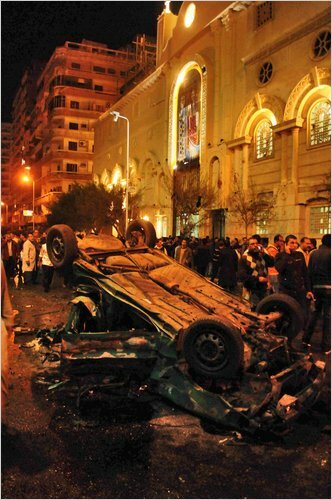 In Egypt, a New Year’s Eve bombing killed 21 and wounded many more attending a midnight mass. In the northern occupied part of Cyprus, police halted a Christmas service forcing the priest and worshippers to evacuate the place of worship on the one of the holiest of Christian holidays. Unfortunately, neither incident is surprising for those affected by them; they have been living in the shadow of religious fear for quite some time. What is surprising is that governments and the larger global community have done little to protect them and that most major media outlets reported the problem only when hate turned to bloodshed. As thousands crowded Times Square, the proclaimed cross-roads of the world, on New Year’s Eve to celebrate a new beginning; thousands more at the world’s major religious cross-roads wondered if this would be yet another year where their dignity and freedom would take a back-seat to geopolitics. Despite the numerous assaults they endure, they tried to unite to pray. Praying for tolerance? So that they could feel safe to turn their heads to their God amid neighbors who bow their heads to Allah. Praying for protection? So that their plight could be addressed by world leaders who claim concern about human rights. Praying for attention? So that they no longer suffer in silence. It may be out of our hands to help teach tolerance to those that resist it, although we should try. It may seem difficult to sway political leaders, whose concerns seem to change with the election cycle. Again, we should try. But with every post, article, comment or tweet, we CAN help shed light on what our Christian brothers and sisters are going through. Through information, some may find tolerance; through support, political pressure. I hope you’ll join me; their plight is important and deserves to be told.